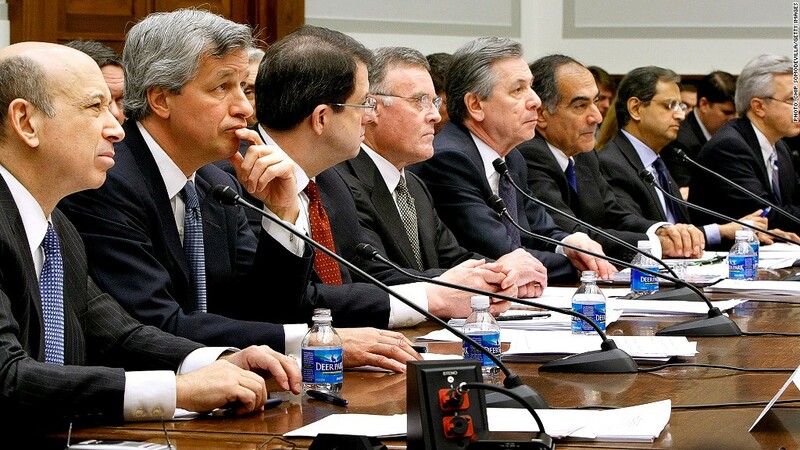 Some of the original 9 big bank CEOs testifying before Congress after their banks were bailed out by the federal government. Another bailout CEO bites the dust. With the departure of Citigroup's (C) Vikram Pandit on Tuesday, only two of the nine original CEOs still lead the big banks that received $125 billion in bailouts during the height of the financial crisis. Goldman Sachs (GS)' Lloyd Blankfein and JPMorgan Chase (JPM)'s Jamie Dimon are the last two Wall Street bank CEOs still standing of those who attended the infamous Oct. 13 meeting in Washington. With the nation teetering on the edge of a financial collapse, nine leaders of the largest U.S. financial institutions were summoned by then Treasury Secretary Hank Paulson, Federal Reserve chairman Ben Bernanke, New York Federal Reserve chief Tim Geithner and Federal Deposit Insurance Corp. head Sheila Bair. "Nine men stood milling around in the room, peremptorily summoned there by Treasury Secretary Henry Paulson," wrote Bair in her book Bull by the Horns. (Bair is a contributor for Fortune, which excerpted the book.) "Collectively, they headed financial institutions representing about $9 trillion in assets, or 70% of the U.S. financial system. I would be damned if I would let them see me shaking." The meeting was the beginning of the largest government intervention to save the financial system since the Great Depression. The $700 billion sanctioned by Congress for the Troubled Asset Relief Program eventually also saved insurer American International Group (AIG), failing mortgage financiers Freddie Mac and Fannie Mae, and auto industry giants General Motor (GM)s and Chrysler. Some of the other bank chiefs who also attended the Treasury meeting met with ignominious ends. John Thain, who led Merrill Lynch for just a year, was ousted from his job after reporting huge losses as the investment bank was being bought by Bank of America. Thain left amid an investigation by the New York Attorney General that the bank's executives enriched themselves with "secret" bonuses. Ken Lewis left Bank of America (BAC) in October 2009 after the bank came under a barrage of investigations and lawsuits from government agencies and shareholders over the circumstances surrounding the Merrill Lynch acquisition. The other chiefs included Richard Kovacevich, who left Wells Fargo as chairman in December 2009, John Mack who left Morgan Stanley (MS) in January 2010, Ronald Logue who left State Street Bank in March 2010 and Robert Kelly who left Bank of New York Mellon (BK) in September 2011. The two banks that are still led by pre-financial crisis CEOs are JPMorgan Chase and Goldman Sachs, long considered among the stronger of the original nine banks that got bailouts. "As you look at the nine general recipients, keep in mind that some of these companies were in better shape than others," said Bert Ely, a longtime banking industry analyst. "The departures have a lot to do with where the CEOs were in their tenure at the time of crisis." Citigroup's Pandit, Bair wrote, was particularly angry with her at that notorious meeting, for allowing Wells Fargo to buy Wachovia. Pandit had originally bid to buy Wachovia, and was hoping to get her agency's help on the deal. 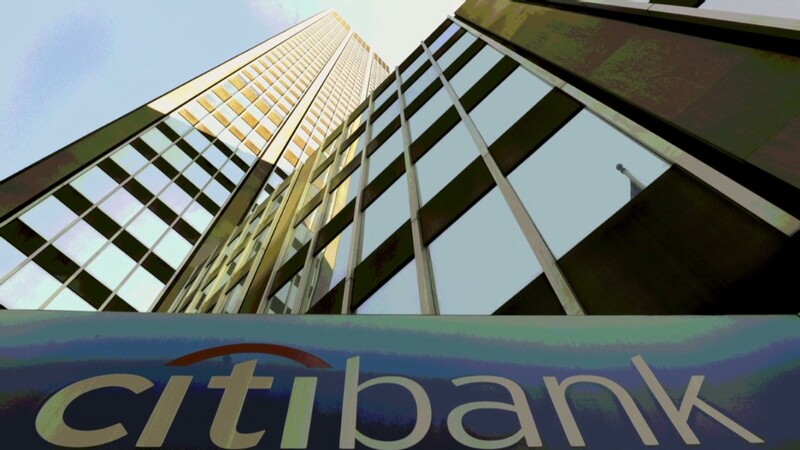 "He and his primary regulator, Timothy Geithner, the head of the New York Federal Reserve Bank, were angry with me for refusing to object to the Wells acquisition of Wachovia, which had derailed Pandit's and Geithner's plans to let Citi buy it with financial assistance from the FDIC," Bair wrote. " I had had little choice. . .The last thing the FDIC needed was two mismanaged banks merging."